This article originally appeared on The Trek and can be found here. You’re not going to tell me pop-tarts aren’t ultralight, are you?!? Actually, that’s exactly what I’m saying. A significant amount of my time over the last year was spent reviewing various blog posts and forums discussing foods typically consumed by thru hikers. It was shocking to learn that foods reported to be calorically dense for the trail aren’t calorically dense at all. 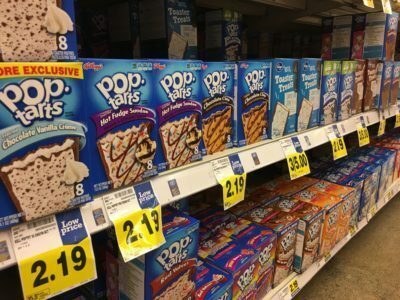 Pop-tarts, a thru hiker staple, actually fall near the bottom of the list when compared to ultralight foods available. Essentially, ultralight foods can be defined as those that meet a determined calorie goal without exceeding the maximum daily food weight goal. Confused, yet?!? For example: Goal of 3500 kcal with a maximum weight of 1.5 lb (0.7 kg) daily would require foods to be an average of 145 kcal/oz or 5 kcal/g. Let’s take a quick look at a few thru hiker favorites. Do they meet your goal? An initial review of over 100 thru hiker favorites can be found in the files section of the Backcountry Meal Planning for Thru Hikers Facebook group. Additional foods will continue to be incorporated into the list as time permits. As you’ll see in the file, many commonly available foods do not meet ultralight criteria. Don’t panic just yet! Keep reading to learn how to maximize the foods that are available. Ever participate in a grocery aisle photo shoot? Here’s your chance! 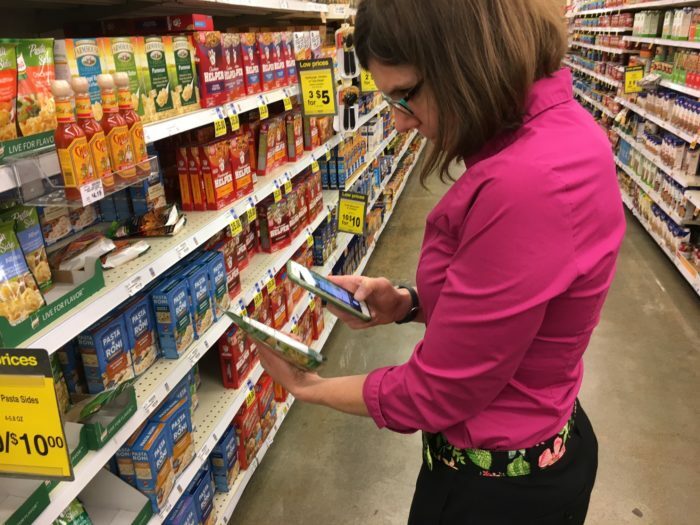 Next time you visit the grocery store don’t be shy, take photos of food labels and review the numbers later when you have time at home. If someone asks what you’re doing, this presents a perfect opportunity to share what an amazing journey you’re about to embark on. Trust me! Fellow shoppers will think it’s pretty cool that you’re considering your diet while on trail. 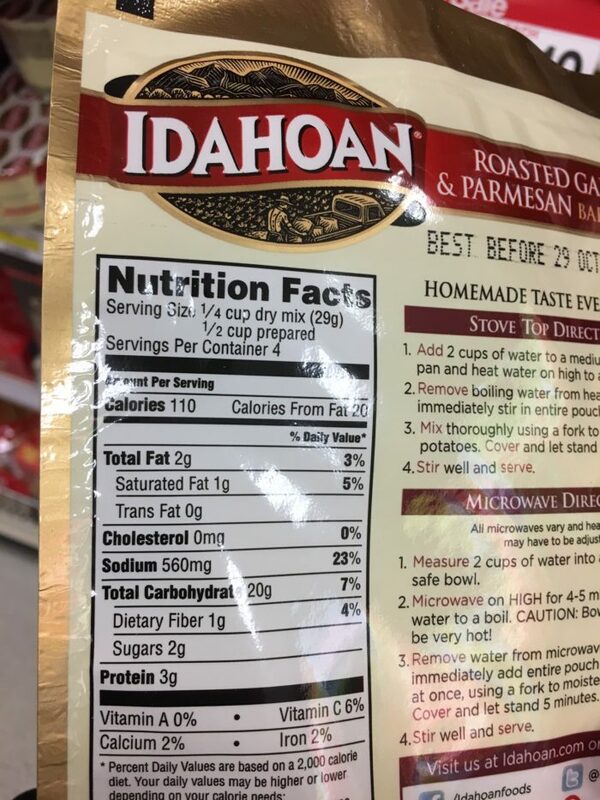 Make sure the that net weight of the food is visible in the photo as you will need these numbers when calculating how many calories per serving. Make sure that the print is legible in the photo as there is often a glare making the label difficult to read. Just kidding! I’m not suggesting that a complete thru hiker diet makeover is necessary. However, I do feel that current diets can be augmented by using more calorically dense foods achieving the ultralight goal set. As you can see, this meal plan includes foods at varying kcal/oz levels with the average meeting my 150 kcal/oz goal. By using this method, calorie and weight goals are met while also consuming foods that I enjoy. This might seem complex now but will be simplified in the meal planning blog entry that’s to come. Enough already about calories and weight! What about protein, carbohydrates and fat? Yes, let’s move on to talk about high performance expectations thru hikers should have of their food. I will briefly touch on metabolism as there are hundreds, if not thousands, of research studies dedicated to endurance sports nutrition. Metabolism is simply your body’s ability to burn the fuel (i.e. food) consumed to produce energy. How well you fuel your body greatly impacts how your body will respond to the demands of thru hiking. Now’s the time to put your new food label reading skills to use. Having a better understanding of what’s in your pack will help dictate your fueling strategy. Protein plays an important role in a thru hiker’s diet as it is responsible for repairing and strengthening muscle tissue. For an average adult, 0.8 grams of protein per kilogram (0.8 g/kg) or 0.36 grams of protein per pound (0.36 g/lb) body weight is recommended. Athletes oftentimes require more than twice that amount. 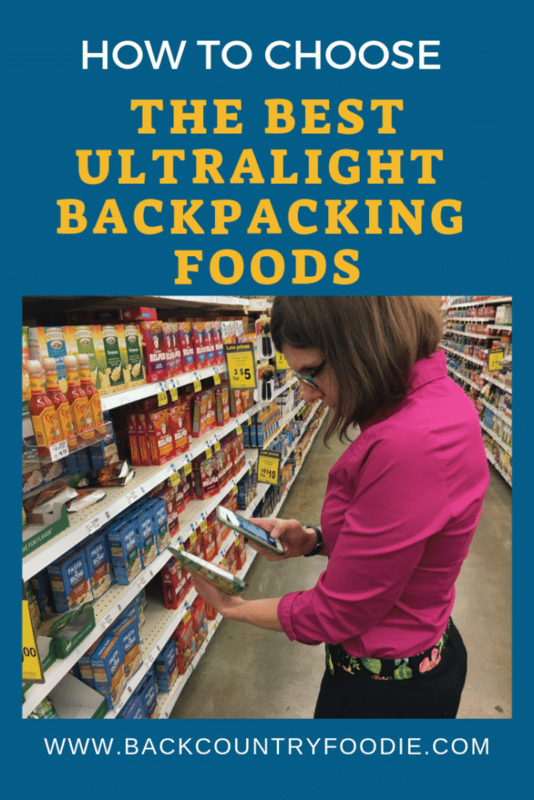 Consuming adequate protein while thru hiking can be quite challenging for many thru hikers for a variety of reasons including limited shelf life, weight of protein-rich foods and dietary restrictions. 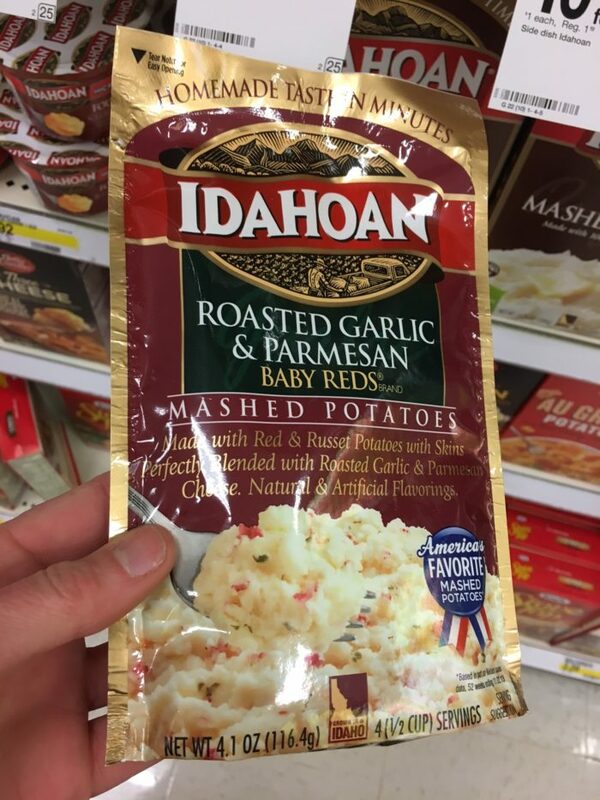 Carbohydrate inake plays an important role in a thru hiker’s diet because without adequate carbohydrate intake muscle protein is used to produce energy. This presents a problem when taking in adequate protein is already a challenge for thru hikers. The type of carbohydrate, simple versus complex, adds on another layer of complexity. Many of the commonly available trail friendly foods are high in simple sugars (i.e. honey buns, pop-tarts, candy) which provide quick boosts of energy. Thru hiker diets benefit from complex carbohydrates (i.e. fruit, vegetables and grains) over the long haul as they are often rich in fiber and provide sustainable energy. Fiber intake seems to be completely avoided in all of the blogs and forums that I’ve read. Ok, are you ready for it? As a dietitian, I talk about constipation with my patients on a daily basis. No need to be embarrassed about talking about it here either. The fact is, thru hiker diets are typically void of fresh fruit, vegetables and whole grains which are the primary sources of fiber in ones diet. Hikers, however, likely consume a fair amount of beans which are an excellent source of fiber but there’s the other known consequence of beans. Just say’in! Therefore, when meal planning it’s important to also be aware of the fiber content of foods. Fat is an excellent source of energy for thru hikers as it is over twice as calorically dense at 9 kcal/g when compared to carbohydrates and protein at 4 kcal/g. This translates into higher calorie foods for less food weight. Fat also takes significantly longer to digest resulting in sustained versus quick boosts of energy. Meals containing fat, however, are typically not shelf stable for extended periods of time which presents a problem for thru hikers. All of this talk about calculations, weight, calories and nutrition is of no use if you’re not willing to consume whatever is in your pack. If pop-tarts, tortillas and Skittles make you happy, then by all means pack those items. Food plays a huge part in daily life on and off the trail. 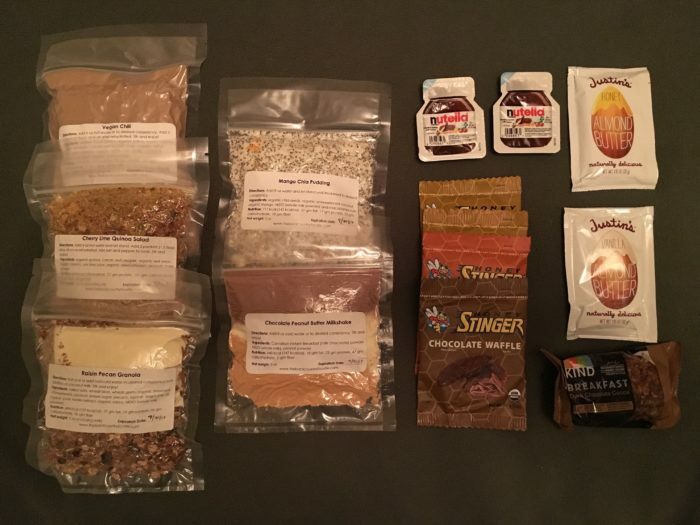 If you like the idea of giving ultralight meal planning a try, stay tuned for the upcoming blog topic, Trail Food Gadgets and Meal Preparation Hacks, including everything I wish I would have known from the start. Consider joining the Backcountry Meal Planning for Thru Hikers Facebook group as this is where you will find experienced foodies and thru hikers representing all of the long trails throughout the United States. Your questions will not go unanswered. For additional tips & tricks consider following my Instagram and/or Facebook feeds as I share the results of ongoing meal planning experiments in the backcountry. Aaron Owens Mayhew, MS, RDN, LD is the founder of Ultralight Meal Planning for Outdoor Explorers and owner of Backcountry Foodie™. Aaron is a registered dietitian and ultralight long-distance backpacker with a passion for food. She spends much of her time experimenting with new ultralight recipes in her kitchen and later trail tests them to ensure that they meet backcountry adventurers’ needs. Aaron also offers a nutrition consulting service where she helps outdoor adventurers meal plan for their next big trip. She counts calories so you don’t have to! You can follow Aaron’s adventures in the kitchen and in the backcountry via Instagram and Facebook.